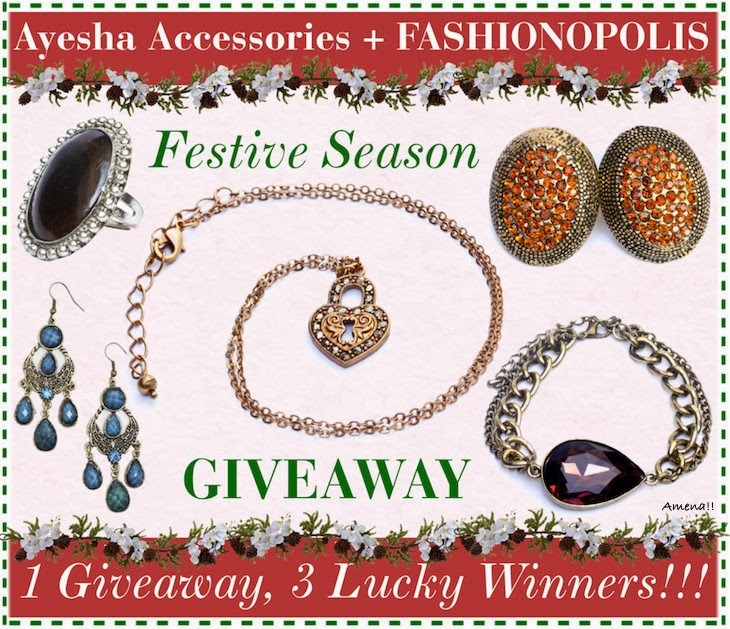 Fashionopolis is happy to be associated with one of India's trendiest accessory brand, Ayesha Accessories, and announce an end of the year, festive season giveaway exclusively for friends and readers of Fashionopolis. 3 lucky friends and readers of Fashionopolis stand a chance to win an exclusive INR 1,000/- gift voucher from Ayesha Accessories. 1. Giveaway is open to Indian residents only. 2. Both women and men can participate in the giveaway. 3. Please follow all the steps mentioned in the above Rafflecopter for valid entires. 4. All the entries will be validated thoroughly before the winners are declared. Giveaway ends 12th January 2014, 11:59 P.M.
Get started!!! Tag, tweet and share. Spread the word. The more the merrier!!! My heart sulks looking at those accessories from Ayesha! done!! keeping my fingers crossed..!! Done all steps. Hope to win. Awesome giveaway. All steps done. done dear, hope to win.. Being fashionable is all what i want. Coach bags are in trend and i am sure will always be. I love to carry those bags with me.